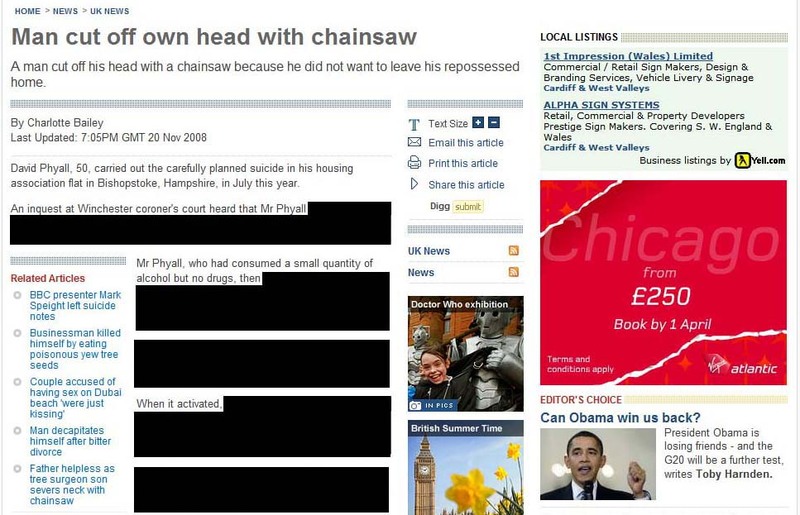 “Man cut off own head with chainsaw” was the headline: “A man cut off his head with a chainsaw because he did not want to leave his repossessed home.” What followed this headline was not a news story: far from it. What the Telegraph published was a horrific, comprehensive, explicit, and detailed instruction manual. In fact this information was so appallingly technical and instructive that after some discussion we have decided that the Guardian will not print it, even in the context of a critique. It gives truly staggering details on exactly what to buy, how to rig it up, how to use it, and even how to make things more comfortable while waiting for death to come. [The Telegraph] suspended the article from its website following the contact from the PCC. So, to review this cascade of twattery: the PCC has guidelines on how suicide should be reported. These guidelines were ignored in 12 cases. 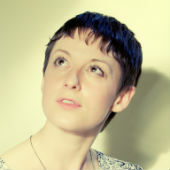 The PCC was especially critical of the manner in which the Telegraph‘s online article breached the code, and “expected that the situation would not be repeated”. Two months later, the material is still there and still extravagently explicit. Excellent self regulation there. Fearsome and authoritative as ever. In the comments thread on the Bad Science blog, this was quickly dragged into freedom of speech bickering. “Freedom speech is not a zero sum game”, said one exasperated commentator: “Free speech and freedom of information is not freedom to shout about it.” This story could have been a news-in-brief. It could have excluded all the detailed instruction derived from the coroner’s report. It could have followed The Samaritans’ simple guidelines for reporting suicide in the least damaging way possible. Not only did it fail on every particular, but the online article goes on to make things astonishingly worse. Have a look on the left at the “related articles” box: if death-by-chainsaw doesn’t appeal, a thoughtful Telegraph sub (or handy algorithm) has picked out five more power-tool and self-destruction related stories. How about making an exit via wild herbs? Hanging? Seriously, your suicide method could be just a click away, and the Telegraph‘s editorial policy is apparently to make sure you’ve got every detail you need to clinch your own fatality. I think it’s appalling that where guidelines are made available to reporters they are not followed. I have seen articles in the press that have used terminology considered offensive to (to pick just two examples) people who are lesbian, gay or bisexual and people with schizophrenia or other mental health problems. I think that the example of suicide involves the potential for serious physical harm (including death) to readers and is therefore particularly worrying.